Photography is a major tool used by biologists to document their work. The biologist does not have to be a college professor to use this tool. 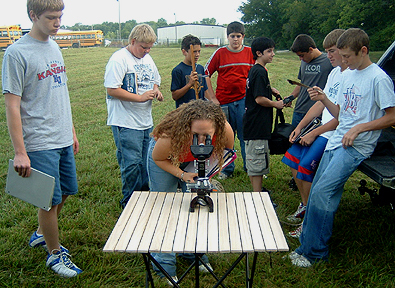 The following photos were taken by a freshman NHJH biology student during September 2004. 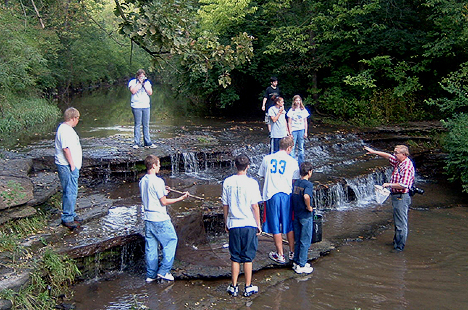 They help document a field trip taken by her class to explore life in and near Indian Creek located in Shawnee County, Kansas. 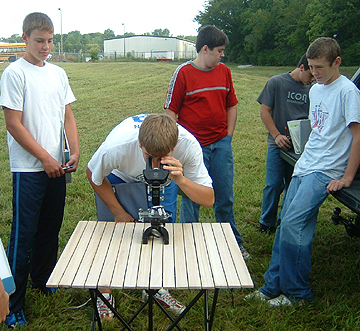 Students are encouraged to use photography to document their work. The photos may be used in hard copy reports or displays or they may be used on websites. Websites are actually quite easy to create with some of the online providers. This website was created using Tripod. A link to Tripod is given below. It is very important that students creating websites make sure they have the permission of their parents. Personal information in regard to specific students should not be incluced on websites. The counter is reset on a regular basis. The Tripod icon below can be used to find out more about creating a website.